Over 3000 Rehabilitation visits provided in our clinic in 2017! 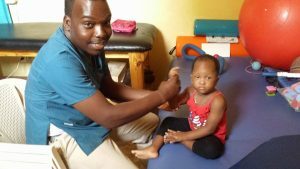 2017 was an amazing year for the Rehabilitation Clinic in Artibonite! We are making a difference for so many in this community. We now have three rehab technicians working full time providing rehabilitation services to children and adults with all types of needs. 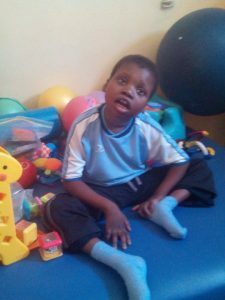 We care for patients with musculo-skeletal, neurological and developmental disorders. 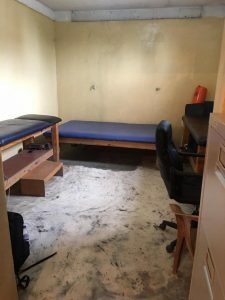 We provide services in our clinic in Gonaives as well as through our community based rehab program in remote areas of Haiti. Our pediatric program continues to grow. The need is so great in this area. 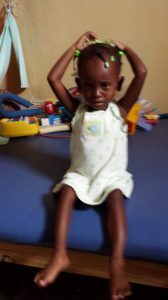 We are hoping to expand our program to be able to provide nutrition for these children (and their siblings) and assist with transportation to and from the clinic. This year we will be working on making positioning devices that will help these children be upright so they can interact and be more involved with their communities. Through our interventions, we are enhancing their lives and preventing these children from being placed in orphanages. First Year of our Therapy Clinic is in the books! We are so pleased with our progress to date. The number of people we were able to provide care for has steadily increased throughout the year. We are now open 5 days per week and have expanded our services to include community based rehabilitation one day a week in the remote village of Lacoupe and its surrounding villages. People travel for hours on foot and by donkey to attend our rehab clinic day in this remote area. 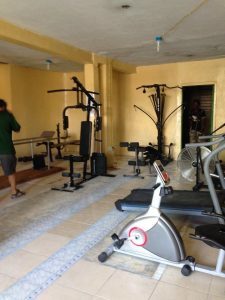 January 2016: the new rehab clinic in Gonaives opened its doors! 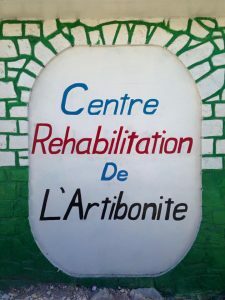 On January 7, while on one of our trips to Haiti, the Rehabilitation Clinic of Artibonite in Gonaives, Haiti had it’s grand opening. This was a culmination of many months of preparation and fundraising to accomplish this important goal, to provide access to rehabilitation services and wound care to this community of 300,000 people. We are so happy that adults and children in this area will be served. Imagine having a stroke, spinal cord injury, car accident or caring for a child with special needs without the availability of these rehabilitation services. This clinic also serves as a central hub for our Community Based Rehab Program in the surrounding mountainous villages. We can now reach even more people in the remote communities of Haiti. Our teams will continue to participate in mobile medical and rehab clinics in areas that have little or no access to healthcare. 2015 – Preparing to open a rehab clinic in Haiti. Help us make it happen! Imagine having only one leg and no way to get around, no crutches or walker. Imagine only being able to walk a few feet, and the well where you get your water is a mile away. Wouldn’t it be amazing to make a life changing difference for a person with a physical disability by giving the gift of mobility? Gonaives is an area of northern Haiti where there is no access to rehabilitation services. We are preparing to open a rehab clinic in this area to provide services for the people in need in Gonaives and also provide outreach programs for the surrounding mountainous villages. Due to the devastating earthquake in 2010, many Haitians suffered life changing injuries and now have significant physical disabilities. 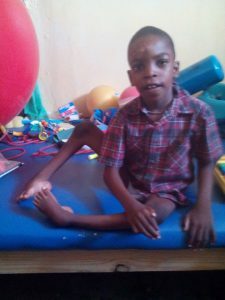 It has been estimated that 10% of all Haitians have a disability. Providing mobility devices and rehabilitation services will dramatically improve the quality of life for people who are most in need. That’s why we started our Mobility Devices for Haiti program. This program provides canes, crutches, and walkers for those in need in Haiti and employs individuals with disabilities. 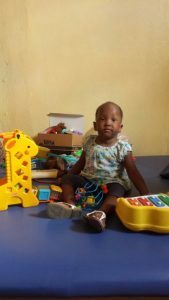 Devices are made out of PVC pipe by individuals with disabilities in our shop in Haiti and are delivered to those in need in nearby villages. The people residing in these villages often have no other way of obtaining or learning how to use a mobility device. Your contribution will help us reach out to the most vulnerable group in the poorest country in the western hemisphere and help them to walk! When we returned in April 2013, we had the privilege of interviewing all the members of the team. This is when our vision became clear. When asked about their hopes and dreams, everyone of them said that the most important thing for them was to find work. Not one asked for money. They wanted to be able to be self-sufficient, and provide for themselves and their families. They told of the difficulties and discrimination they faced because of their disabilities. Tap-Tap buses, the Haitian form of public transportation, would not stop for them. They said people would not give them jobs, even though they could do it. We knew what we had to do. In late 2013, we opened our shop in Port-Au-Prince, Haiti, providing a work-space for those with disabilities. We had the opportunity to train eight young gentlemen (who had an arm or leg amputated) to make canes, walkers and other items out of PVC pipe. Others with disabilities were trained in sewing and embroidery. 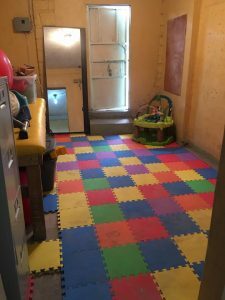 At the shop, they have the opportunity to work to support themselves and their families in a country where finding employment is difficult, and even more difficult for those with disabilities. 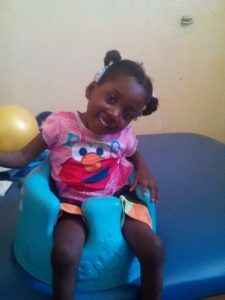 In February of 2012, we volunteered at Hospital Bernard Mev in Port-Au-Prince, Haiti in the spinal cord injury unit, pediatric unit, and rehab clinic. There we learned about the continued challenges that those with physical disabilities experienced in a country with limited medical resources. We also spent time with the amazing Team Zaryen, Amputee Soccer team. This team was created after the 2010 earthquake when hundreds in Haiti had limbs amputated due to severe injuries or wounds. Zaryen, the Creole word for Tarantula, is a spider known to carry on despite the loss of a limb. Zaryen describes the team’s passion to expand beyond soccer. This team wants to send a message of hope to all who are disabled, that they can carry-on and be successful in Haiti. By playing competitive soccer with crutches, they are able to demonstrate their mission clearly. In 2012, only 2 members of Team Zaryen had a formal job. Team members were unable to support themselves and were often homeless and hungry.